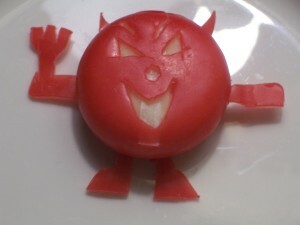 First up, I’ll indulge in a little in joke for those who attended Sunday’s meeting: Cheese Demons. Ok, now for the one of the lessons of the meeting (apart from sleep deprivation can make you not hear things correctly). Most of us who write speculative fiction know the importance of world building, but sometimes we must restrain ourselves from flooding the page with an info dump overload of our well-prepared facts of the world. Conversely though, sometimes the world is so fully fleshed out in our mind we forget to put details on the page, or at least early enough to ground the reader in the world right away. When a reader starts a story without the world presented their imagination will build it for them. If you let their imagination do all the work and they envisage a modern world of corporate business, sky scrapers and dark back alleys for nefarious exchanges, then you suddenly mention household lighting is by candle or lamp oil your reader will be shocked out of the story and have to reassess everything they have read. Small things can help you without having to succumb to the dreaded info dump. How your characters speak and behave will influence a reader’s imagination. A quick description of an outfit helps too; is your sixteen year old girl sporting a bustle and panniers or jeans and a t-shirt with a nerdy mash-up on it? What about her surroundings? A quick sentence about the jagged wreckage of smashed skyscrapers tells us we’re in a city post-apocalypse, or a line about hazy blue mountains smothered in eucalypts makes us fairly certain we’re in mountain ranges in Australia. These little details don’t take long but they reveal your world and ground the reader. Another benefit of keeping it small and simple is you still get to let your readers’ imagination run wild filling in the blanks for themselves. Now, shifting gears from the lesson, I’d like to invite any of you heading to the Brisbane Writers Festival to come to the Vision Writers Open Session on Saturday 5th September at 4pm in Kuril Dhagun at the State Library Queensland. We’ll be presenting our meetings as we run them so you can hear some of our stories and check out our critiquing style. We hope to see you there. This entry was posted in Meeting Wisdom and tagged small details, world building, writing tips. Bookmark the permalink.